Thought for the day: The need to Know. “It wouldn’t be Friday night without a little fun. 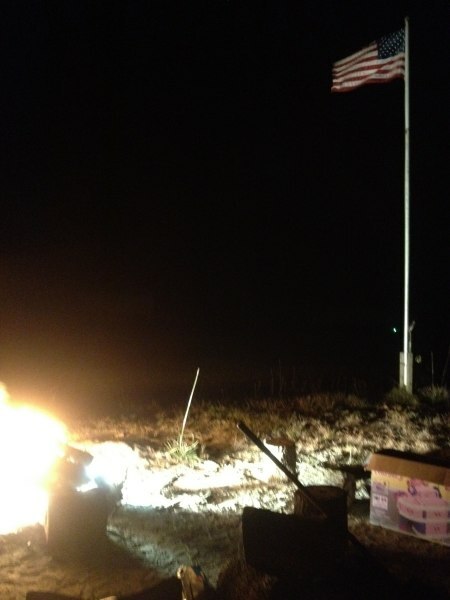 Our neighbor Roger was having a cookout and a bonfire in his front yard just down the runway. We missed dinner, but arrived in time for the relaxing around the fire with a beer phase. Most builders know that the one pound cooling fan on a late model Corvair car is made of magnesium. We brought one down and after warning those present, tossed it in the fire. It ignited after a minute of warming up. For five minutes you could have seen our airport from low earth orbit. The camera doesn’t do the event justice. It illuminated the entire southern end of the airport; you could have read a newspaper 500’ away. At most airports this would have brought firefighters, hazmat people and the news media. At our airport it brought more people with beer. Here is part #2 of the Jump Start Engine series. This one will cover some background before we move onto details. 18 months ago I wrote a 20 part series on “Getting Started.” The entire series can be found by clicking on this reference page: Getting Started Reference page. In that series, from part#5 to part #9 we looked at 5 different closed case options. The had alphabetized names, AA through EE. The Jump start engines I am proposing, with Gen II Weseman bearings, 8409 cranks and failsafe gears on OT-10 cams are most like the engine described as the third, or “Chas. Charlie” option. You can read about it at this link to part #7: Getting Started in 2013, Part #7, ‘Chas. Charlie’ Short Block. If a builder wasn’t to assemble his engine as a 3,000 cc Corvair, the case has to be machined to accept the larger cylinders. Specifically the six holes for the cylinder spigot bottoms have to be enlarged slightly. This need to be done with great precision. 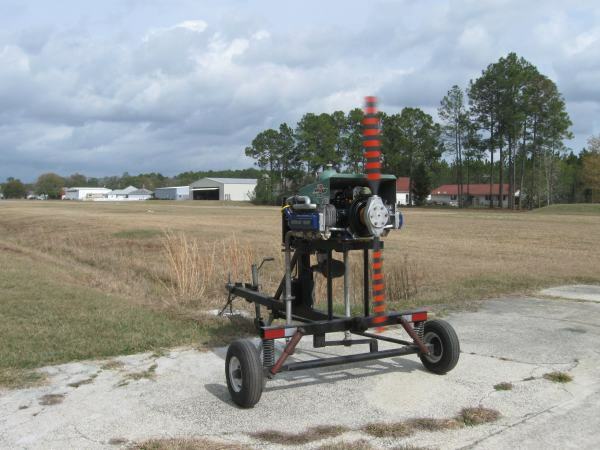 There is an older description of it at this link: 3,000cc Case Modifications. That should be enough reading for one night. On to part #3 tomorrow. -ww. Above, a rear view of a 3,000 cc Corvair engine. Here is a new series on engine building. It will be a detailed look at getting started that will serve many builders. The focal point of this are 10 “Jump Start” engines that we will have in the works for the next months, but the info will apply to anyone building a Corvair. What is a “Jump Start” Engine? Basically it is a complete core engine, that has some of the difficult parts done for the builder, but still needs work from the builder and replacement and conversion parts to be completed. Picture a builder who wants to build an engine, but is having a bit of a time finding a good core. He wants to do some prep work, reading and learning at home, but his goal is to bring his project to a single college and finish and run the engine in 3 days. He is a candidate for a jump start motor. 2) I take the heads while they are here, machine the carb pads off and weld on a set of the aluminum intake tubes. This is done after the heads get a rough cleaning and have all the old parts like valves and springs removed. 4) We can crate and ship this to the builder. He can then get familiar with all the parts, and at his own pace complete the engine. We can send him the heads, or we can forward them to Falcon Machine for rebuild. After getting everything organized and prepped, the builder can bring the completed case, plus all the prepped parts to a college, and with steady work he can go home with a completed running engine. Above is a close up of a 2nd Gen Dan bearing journal on a re worked GM crank. This is a 2700/2850 ready case we put together we sold at CC#24. “Is this a Kit Engine?” No. It is called a Jump Start engine to differentiate it. Kit implies that every single part in the box. This has all the core parts, but still needs many items like pistons, the rods to be rebuilt, gaskets, rod bearings etc. Part of the goal here is to keep the thing affordable. If it was a kit with everything in the box, it would be a lot of money all at once. This will cost some money, but getting started with this is going to be less than 50% of the cost of building a motor. “Can I just get you to make me a kit motor, you know, with every single part in the box, carefully cleaned, and prepped and painted?” Sorry we don’t offer that. Here is why: If I did all that, and it had an assembled case, It would actually take me about the same man hours to assemble the engine as it would to carefully pack the individual parts in boxes to ship. The time in building an engine is the prep work, not the assembly. If I sold a kit engine it would have to be nearly the same price as a completed engine from us. Contrary to what some people think at first glance, engines like our $10,750 running 2,850 cc engine are mostly parts cost and only some labor. Why do many VW engines come as kits? How are they different? With Corvairs, we are investing sweat equity in the engines in order to rebuild a very high quality American engine with new parts that are also made in America. The great preponderance of VW engines are made of all new parts….that come from the Peoples’ Republic of Red China. Yes, they once came from Germany and Brazil, but that was long ago. Today, most VW parts, cranks, cases. heads, all come right from mainland China. My goal is to teach people how to build and operate a high quality American engine, not to compete with $2/hr. workers in a police state without civil rights. 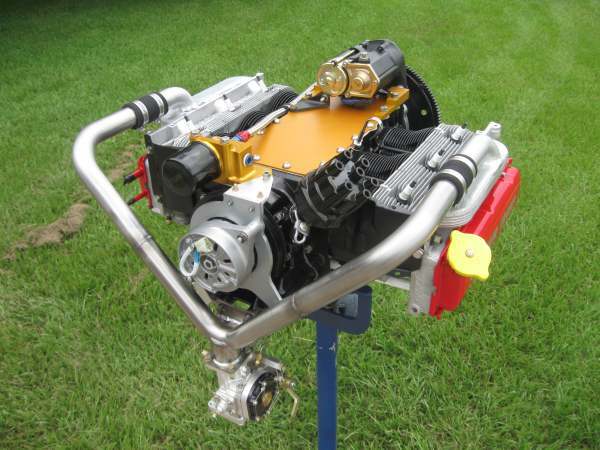 “What if I wanted a 3,000 cc engine?” In this series I am going to give sample builds of 2,700, 2,850 and 3,000 cc Jump Start engines, and I will give an exact break down of the costs for each. “Hey, I already have a core motor.” My first though is just follow along in the series and process your own stuff in parallel with the series. If you wanted to get in on the engine because you liked the closed case idea, or wanted to move up to a 3,000 cc engine (which requires the case to be bored out before any assembly work starts) we could always take your core as a trade in, but most likely we would just help you find another builder who wanted to buy your core from you. 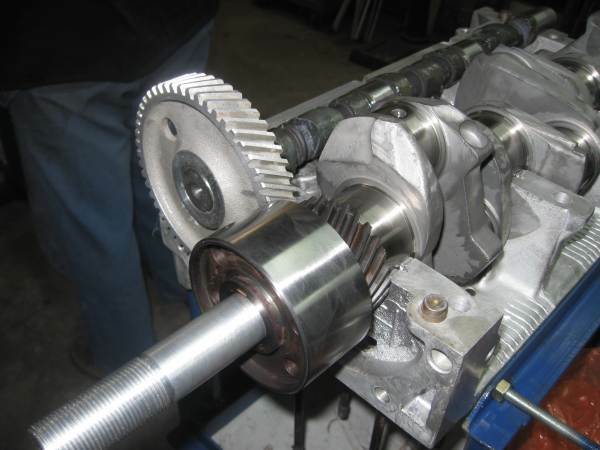 “How quick could I get one?” The crank process takes time., as Dan sends the crank to several different shops for magna-fluxing, heat treating and grinding. There is some calendar time involved here. Right now we are 100 days or so away from the next college. If we take 10 days to write up the series, and a builder wants in, there should be plenty of time to get the work ready for the college. You are a busy guy, isn’t this a big influx of work? No, not really. I already have the engines here. I picked up the 10 cores at the Corvair Ranch in PA on our trip last month. They are already disassembled and partially clean. The crank and 5th bearing part of this will be done by Dan’s experts, I am going to send the cases out for cleaning and boring, I have Vern to assist with welding the head pipes, and the small parts bagging is not a lot of work. What is left is the case assembly, building the rear oil case, and putting the gen II 5th bearing on. That is work, but not an enormous amount. Again, if I was building “Kit” motors, and doing all the work on every part, this would take until the end of the year. What is the budget time line on this? Part of the idea here is to get to the exact numbers though this series. Once we know this, if a builder wants to get in, my idea was they directly pay for the crank processing and Gen II bearing to Dan and Rachel Weseman, which is $2,200. This would function as ‘the deposit’, the rest would not need to be paid until we were going to ship it of bring it to a college. If the builder wanted to get the heads for it sooner so he could get them in the works, we could arrange that they would leave before the case was done. That is all the preliminary questions I could think of. If you have more, tune in for part #2 tomorrow, or feel free to ask them in the comments section, I will address them in the next part. -ww. Thought for the day: Demand for the Truth. I came across this gem a few years ago. I might have been a lot more successful, and certainly more popular, had I read and understood this bit of wisdom much earlier in life. For all the years I have worked with Corvairs, I have told people “I am not going to tell you what you want the hear, I am just here to teach what you need to know.” On paper that has a lot of fans, in reality it has a selective audience. For those seeking to have old wives takes, incorrect assumptions and mechanical prejudices affirmed, I am the wrong guy. If you are interested in learning the things I have discovered about building and flying planes, good, I can help. If your plans of building and flying demand facts and proven information, I have a pretty good supply. 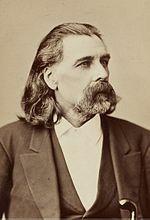 Henry Wheeler Shaw went by the stage and pen name “Josh Billings.” He was an American humorist and lecturer, a contemporary of Mark Twain. In his day he was immensely popular, but is largely forgotten today, perhaps because his humor was based on telling people witty observations they didn’t want to hear. – Lazarus Long, as written by Robert A. Heinlein. In the quote above, Heinlein is speaking of possessing and exercising real skills. Nothing the man did nor thought was part of the “check the box off” mentality that many people have today. Heinlein came from an unusual background to be one of the greatest Science Fiction writers of all time. 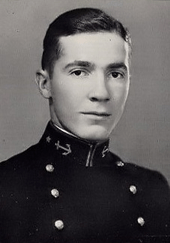 Above is his 1924 US Naval Academy graduation photo. Few people know that he wrote the phrase “An armed society is a polite society.” Throughout his life, Heinlein’s thoughts, perspectives and philosophy constantly evolved. He did not try to be offensive, but he placed little or no value in conforming to any societies expectations. Right now I am reading a little know work, by a well-known author, James Jones. He is best known for two other books, “From here to eternity” and “The thin red line.” Jones was in the Army before WWII started, and was present at the attack on Pearl Harbor. Le later fought at Guadalcanal. The book I am reading is “WWII” which is a look at the art from WWII, including the painting above. Very rarely is the commentary on art valid, or from a man who knew the subject matter so well. Jones is raw, and at time obscene, but he is widely thought of as brutally honest. Consider how different the films made from his books are from the simple and uplifting stories spoon fed to us by John Wayne. 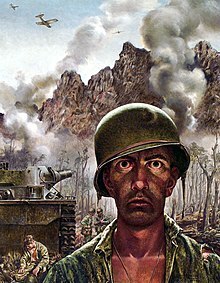 You can learn a lot from Jones: He points out that the Thousand yard stare is not to be confused with Shell shock: A man with the stare still has the agility of a cat, and still is an effective fighter, which means he is not pulled out of the line. A month ago I found an old copy of the companion printed work for the film Victory at Sea, and mailed it to my father. It is largely a photographic work, with very little type. What is there is sparse and harsh commentary. My mother said my father spent many quiet hours looking at it. An important distinction between the US and Allies and the Germans and Japanese that is often left out of popular culture it that the Germans and the Japanese had a full generation to develop an absolute blind and unquestioning allegiance to militarism, as obedient and fatalistic as any cult. This is very different from the admiration and respect we have for our military, yet you will find endless novels and films, particularly about the conduct of German officers (frequently aviators) trying to paint them as no different from our Fathers. 50% of my DNA lived in Germany 150 years ago, I have met, in person, Gunter Rall and I know large number of Germans, and it is a misguided fallacy to suggest that their WWII officer corps was identical in morals to ours. About a week ago, a man born in Germany after WWII told me that “All nations are the same, the US was no better nor different from the Germans were”. I politely told him that I disagreed, because my Father was an enlisted man in WWII, and neither he nor anyone he knew, put human beings in gas chambers. I told him I didn’t believe that 9 million humans were exterminated without the assistance of any willing German fathers. The US does not generate, follow and protect life forms like Franz Stangl, but his country did, and he is not entitled to unilaterally elevate the men who did to the same moral level as those that liberated Bergen-Belsen. It is reading, not Hollywood films and bumper sticker quotes that protect us from revisionist propaganda. I am ashamed to say that one of the single most impressive jobs of cleansing history was done by our own government. Anyone who wishes to read a little, can examine the case of Wernher von Braun. In popular culture, he is the hapless German scientist who just tries to survive WWII, and then is relieved to come to the US where he can work for peaceful space flight. It is a pleasant myth. Today we kill people who are just thinking of developing weapons of mass destruction. Von Braun is the granddaddy of them all, and yet we not only put him on the covers of magazines, we taught our kids he was a great and admirable human being. The fact that many Americans accorded him the same respect as another European who was an actual scientist gravely concerned with his role in balancing peace with contributing to weapons, Albert Einstein, is a good demonstration of what happens when people don’t read enough and just believe simple tales they are told. In you care to read about it, The Emperor of Japan was a tough sell as a saint. He had personally ordered the use of poison gas against civilians in China 375 times. Sadam Hussein was hung for less. I believe that it was disrespectful to the 405,000 Americans killed in WWII to be less than honest regarding the actual roles played by men like Hirohito and Braun. and save one backward glance when you are leaving for the places they can no longer go. Major Michael Davis O’Donnell was an aviator, killed in action 3/24/1970. His name on Panel 12W, Row 40 of the Vietnam Veterans Memorial, ‘The Wall,’ stood for 19 years before his remains were recovered, 31 years after he was killed. He was laid to rest on the other bank of the Potomac, in Arlington in 2001. As long as people are willing to take the time to read what he wrote and consider it, his life will still have meaning.